The Photos app now brings significant photo editing capabilities that allows you to also add text or drawing to a Photo. You might do this if you want to create a title slide for a slideshow or mark up a photo adding emphasis or humor (think of a drawn mustache) to a photo. Display a Photo you would like to edit. 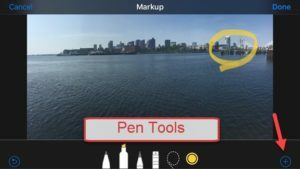 You are now presented pen tools that you can use to draw on the photo. Tap the Color icon to change the color. This information was previously covered in Nugget N4 Write or Draw in the Notes App. Double Tap the Text Box to change the text. Tap Undo to undo the last actions. In the Photos app, tap the edited image that you want to revert. In the pop-up menu, tap Revert to Original.